When we sign up for an internet service, our internet provider assigns us with a unique numerical label which is called an IP address. This IP address is a must have if you want your devices to communicate with the computer network. The IP address serves two functions, network interface identification, and location addressing. Every time we are connecting to the internet using a modem, we are assigned an IP address that is available and not taken by other users. Although you may get the same IP address as a previous connection, often you’ll be assigned a different IP address each time you connect. When internet providers were “born”, everyone connected to the Internet over a modem and most people used the Internet for a few minutes to a few hours per week. Assigning a static IP address to every consumer would have been very pricey for something that most of us used just a few minutes a week, so the providers started assigning the customers with dynamic IP addresses. When modern providers enforce dynamic IPs these days, it may be in part to differentiate between “consumer” and “professional” services, reserving static IPs for customers who spend more for their services. So what happens if the customers purchased and installed a CCTV system at his residence or his business and wants the option of remotely accessing the system to view his cameras? One option is to contact his Internet Service provider and purchase a static IP address that will be assigned only to him. The second option is to sign up with a DNS. What is a DNS (Domain Name System)? In simple words, it is a naming system for computers. It translates domain names, which can be easily memorized by humans, to the numerical IP addresses. Based on the same idea they came up with DDNS (Dynamic Domain Name System) service. DDNS updates a DNS server with new or changed records for IP addresses without the need for human intervention. This allows a fully qualified domain name that never changes to be associated with a dynamically assigned IP address that can change quite often. Let’s take an example . . . when you sign up with DDNS service, they ask you to come up with a domain name, let’s say that your new name is: ‘john.dyndns.com’. This domain will be tied to your dynamic IP address that your internet provider assigned to you. The next time your IP address changes for any reason, the domain name will update itself automatically. The DDNS service solution has two main advantages: You don’t have to remember numbers, only your domain name and you don’t have to be concerned when your ISP changes your dynamic IP address. 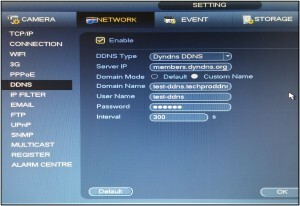 There are many good DDNS services like Dyn DDNS, Private DDNS, No-IP DDNS, Quick DDNS and CN99 DDNS. They are all supported by our equipment and a choice to choose is yours only. But you will probably say: “Wait, won’t the service cost me money?” Well……No! The customers of “Security Camera King” will get that service from us for free. Each customer that will purchase a DVR or NVR from us will get the DDNS service free of charge. 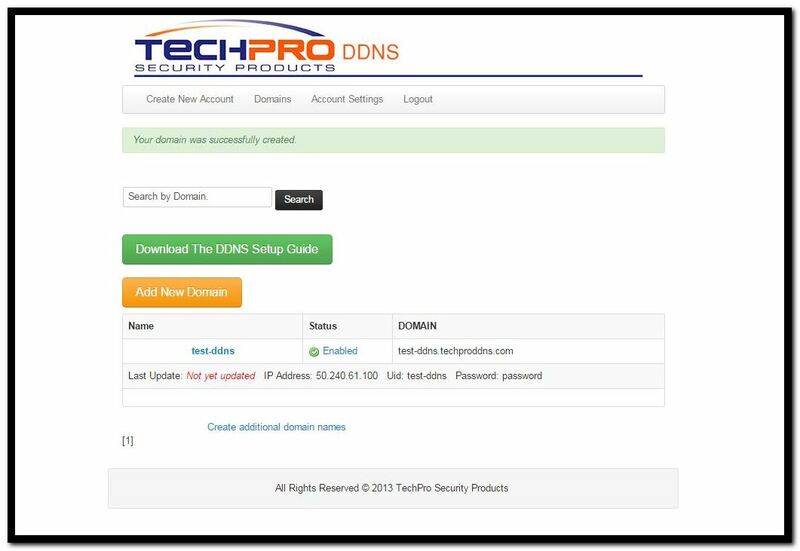 In the next paragraph, I will explain how to set up a free DDNS service with us and utilize it for your system. 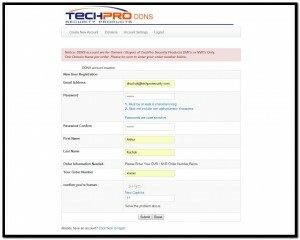 The first thing a customer should do is to go to techproddns.com and fill our simple form. Shortly after, our support department will set you up with an account and you will receive an email that will notify you that the account was created. 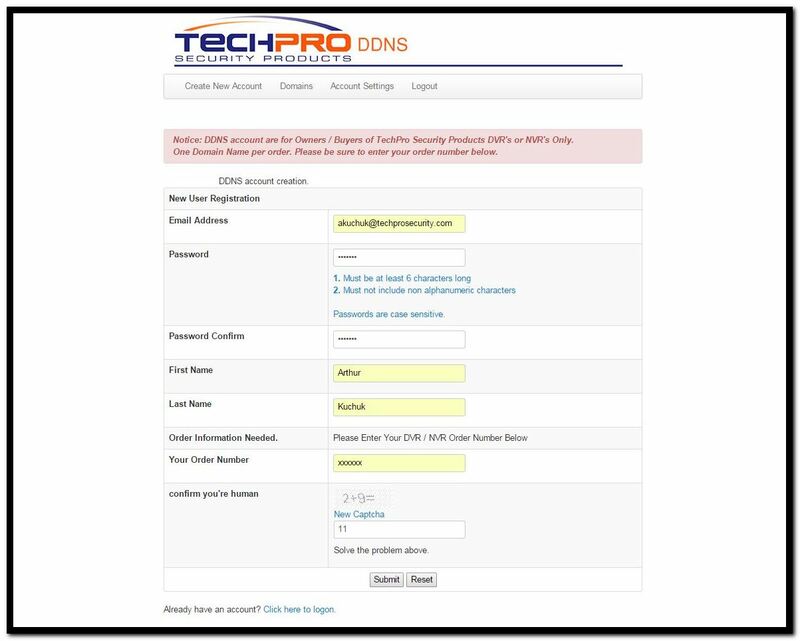 After the account is created, go again to the same page: techproddns.com and on the bottom of the page click to login into the account. The account will ask you to create a new domain name and a password for the domain account. 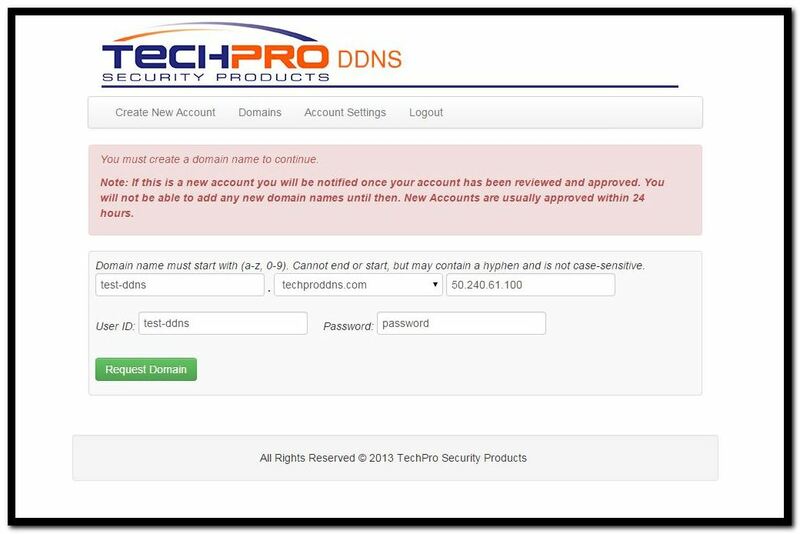 Try not to confuse the DDNS account password with the domain password. The domain password is the actual password that you will need to set up on your DVR. The domain setup will give you a confirmation “Your domain was successfully created” and the page will show all the information about your domain including your IP address that is assigned to you right now by your ISP. Be advised that “Security Camera King” gives you one free domain per one DVR or NVR unit that you buy. But if you purchased more than one unit, there is an option on the same page to create additional domain names. You can also get into the domain menu by clicking the domain name and on that page you can edit your domain names, delete and recreate domain names if you forgot your passwords. It’s time now to go to your DVR or NVR and login into the ‘Main Menu’. Under the ‘Setting’ tab you will select ‘Network’ and click ‘DDNS’ on the right side of the menu. Follow the next screen shot to setup the DDNS menu and remember to enable only the DDNS that you are setting up. You are all done and ready to use your domain name. Remember that you are using a domain that replaces your external IP address and you still have to use it as you are using an IP address, which means that you have to use it only when you are trying to access your CCTV system from outside the network. Also, remember to use the HTTP port when using an Internet Explorer web-interface on your desktop or laptop computer to access your system. It should look something like this: http://test-ddns.techproddns.com:88/ (if your HTTP port is 80, you do not have to enter it after the colon). If you still have problems with setting up your DDNS service, you can always call us at 866-573-8878 to help you out.